I have a MacBook Pro and two Thunderbolt displays at work. I work with the MacBook lid-closed because it's overkill and I don't have enough desk space anyway. Is there a way to do this automatically? With a setting? An AppleScript? Is there a reason that the screens are always flipped? Update: I think I got it. Now, when I plug in my MacBook, if the screens are messed up, I simply hit F13. Sweet! There is an odd bug/feature in OSX that makes default display settings privileged. This behavior has not changed with 10.9 and I believe is what is causing your problem. It is very poorly-documented and discussed on the web. Log on as the root user (you will have to temporarily enable it). I would disable it when done for security reasons. It should remember the external setttings. Did you try to swap the cables behind the monitor in order to invert the connection order? Maybe could do the trick. cscreen doesn't work properly when you have more than 2 monitors, and even if it did, switching primary monitors with it will mess up the positions of your desktop icons. The best solution I know is a utility called SwitchResX (http://www.madrau.com/). It has a feature called Display Sets that effectively remembers everything about a particular display setup (including resolution, orientation, and which screen is primary). 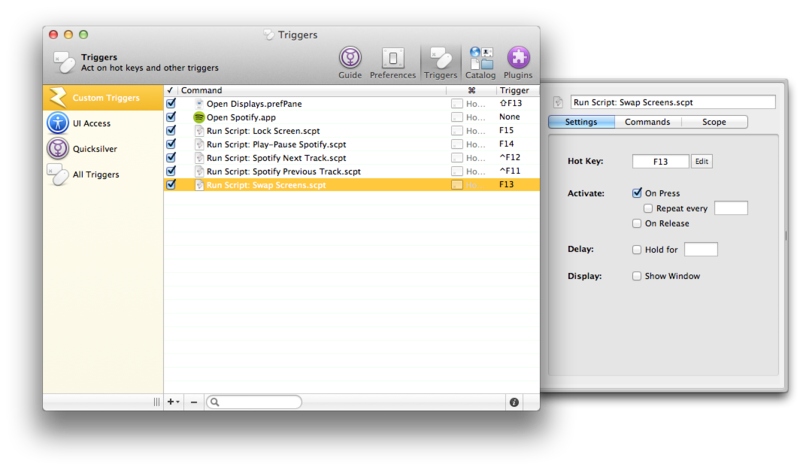 You can then switch to a specific Set from the menu bar or with a shortcut. It remembers the positions of your desktop icons when you switch to a different Set, and puts them back when you restore. 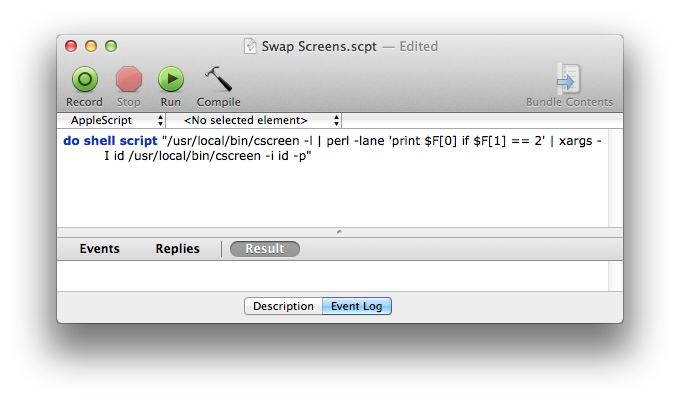 Works like a charm, and there's no need for AppleScript. SwitchResX is also great at its primary function: easily changing screen resolution, even to resolutions not normally available in System Preferences. It's essential if you do a lot of presenting and have to switch res to whatever projector setup you're stuck with. Not the answer you're looking for? Browse other questions tagged macbook applescript display thunderbolt .